There're still no tilesets or anims from Zolionline, so I guess it's questionable that we finish the game before the deadline. You could submit it with wireframe graphics like you're posting here... Just pretend like it's a stylistic choice. It looks awesome from that mind set. Yeah, the wireframe is minimalist enough to come across as stylism. You could still get great scores. And there's usually time between the compo deadline and the cart realisation. And there's also time between the volume 4 cart and the planned remix compo, which is about taking an existing entry and improving it. Or some other free BG tiles on here, like what Twin Dragons did. And, well, you just need something playable; the compo carts are in some ways the equivalent of software sampler/shareware disks…can always create a fuller game later. There is s short freeze (ca. 0.5 s) when morphing, but it is almost not noticable, because you cannot move while morphing anyway. 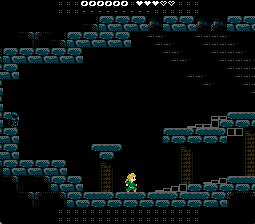 I have build a basic tileset and two testrooms out of Zolionline's mockups: NOW WE'RE TALKING! This feels like a totally different game now. 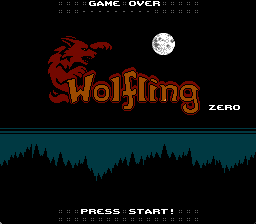 The project has been renamed to "Wolfling Zero", because I'm to busy to include enough content, except for some kind of "mini-game-prequel". Also, I have realized, that my "super-smart" idea to stop music to get enough ram for decrunching is GARBAGE, because like this the music stops on every roomchange. So pretty! Really great work, both of you. The theme does a lot here, there's no denying it. A really good job. The game looks great in the screenshots. At least with all the features colored in on the sprite, it doesn't look like a different character anymore. The hair reads as hair, not a cap. Can the player shapeshift freely? I somehow got the notion when you wrote "moonstone" and "potion" that these would be the transformation and reformation items, sort of like how you're restricted in changing abilities in smb 3, which could potentially be a bit of a platforming puzzle sometimes... though, i don't know if that is what you intend to - just a wild guess on my side. Currently, the only way to morph to a werewolf is touching moonrays, which can be found here and there. Yes, that's it. I haven't found many puzzles that need human or wolf form so far and I would be happy if you have some additional ideas! I haven't found many puzzles that need human or wolf form so far and I would be happy if you have some additional ideas! -I suppose a moon ray could potentially force ling to transform to wolf. That can serve as both puzzle and lock towards another area. These functional restrictions are for naught if the retroformation is always an option. 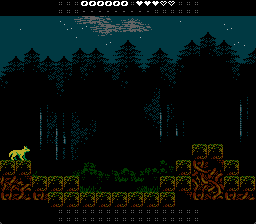 On the plus side, always being able to morph back grants the level designer some leeway to be able to not take care to trap the player in wolf form. Another approach somewhere in between might be to let wolf acquire the skill (moon crystal?) to morph back at will at some point in the game, thus making previous moonbeam locks/puzzles a blast to pass through (if there's even retracing, that is). -Likewise, daggers might be an acquired skill. I wouldn't recommend economizing them as ammo, though. -Is wolf faster than ling and/or has a different acceleration curve? If so, it seems ling can reach higher, but wolf can bridge platforms farther apart on the horizontal plane. -Is wolfs' hit box lower than lings'? If so, wolf might be able to pass narrow passages ling can't. -Do both have the same ability to steer (or not steer) trajectory while jumping? Not sure how i would do such a variation useful in terms of platforming, but i thought i'd mention this aspect anyway. EDIT: Well, if she goes off a cliff and is falling, would she be able to reach an alcove in the same direction she came from? How quick might she be able to do that? Same goes for the prospect of scaling an upright wall with little ledges - here wolf is out of question because wolf can't jump high enough. -Daggers can reach places the player character can't. Thus, daggers may be able to manipulate off-reach interaction points/switches. A variant of this is a special gate that only opens if all enemies have been zapped - just make sure those enemies aren't frustrating to dispose of. You said feature freeze though, so this point is out of scope.